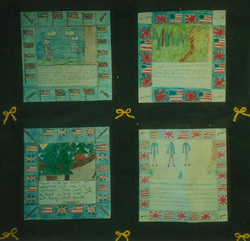 A story quilt is an ideal whole-class extension project that works at all grade levels. Quilt squares feature chapters, characters, or significant scenes from the literature circle book. They can include a border with a repeated design or symbol that represents a key idea. 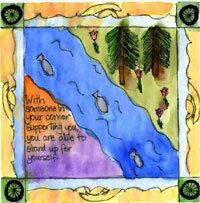 Quilt squares can incorporate visual as well as written components (e.g., an important quote or brief summary). Effective adaptations are possible for all grade levels. 1. After students have finished reading a book, have them choose a key scene, main event, character, chapter, or theme to illustrate. 2. Squares can be made from paper or cloth. The simplest format is white construction or copy paper cut into a square with dimensions of nine to 12 inches. The size of the square and the number of students will determine how large your final quilt will be. 3. 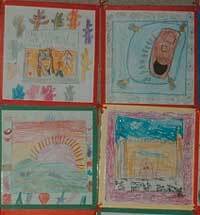 We suggest that you guide students to draw a draft of their quilt square on scratch paper. 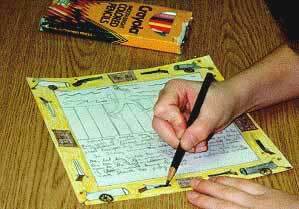 This will help them plan the spacing and arrangement of their visual and written responses. 4. Around the edges of the square, students draw a one-inch border. 5. Inside the border the students create their illustration. We suggest that you have them include a sentence or two explaining the significance of the illustration, or a quote directly from the book that supports the illustration. 6. Students can create their quilts with their literature circle group (so that each group uses a common motif for the border but each student creates his/her own square). You can also create the quilt with the whole class. In that case, students brainstorm ideas for symbols to go around the border and then vote for their favorite. 7. As a final touch, every student draws in the border. 8. You then mount all the squares on a long strip of butcher paper. If you don’t have the right number of squares to make even rows, you can have a student (or group) create an extra square with the title of the book and author. If you need yet another square to even things out, you can ask another student to create a square that identifies the class that made the quilt and include the date. REMEMBER: An important part of extension projects is having each student present their project to the class. With the quilt it is fun to sit in a circle and have each student lay their square on the floor as they talk about their process. This way students get to see the quilt slowly come together into one complete work of art. The other two squares are from a graduate course in teaching with children's literature at Seattle University. "Facing adversity with courage and hope builds character"
"With someone in your corner supporting you, you are able to stand up for yourself"
Click here to go to the Themed Literature Unit web site to learn more about organizing literature circles around themes. 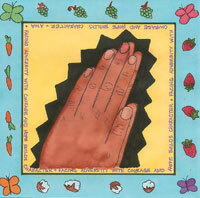 Click here to see sample planning forms for Story Quilts: Example 1 and Example 2. Click here to see a sample evaluation form for Story Quilts.